A 14ft. 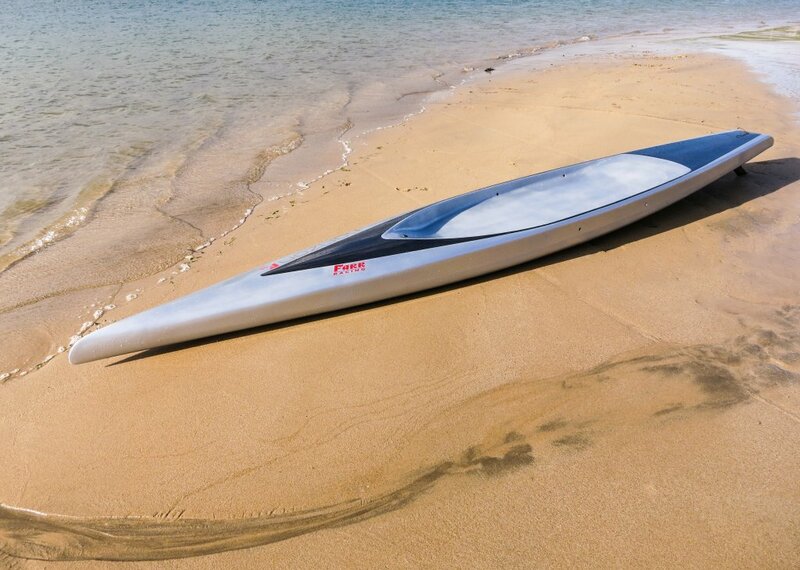 paddleboard, designed for flatwater and estuary races. Features a wave-piercing bow and a subtle peak along the centerline of the deck, allowing the bow to quickly shed water and return to the surface. At 14ft x 26.5in., the shape has a volume distribution and rocker curve to maintain the desired combination of low wetted surface and wave drag. 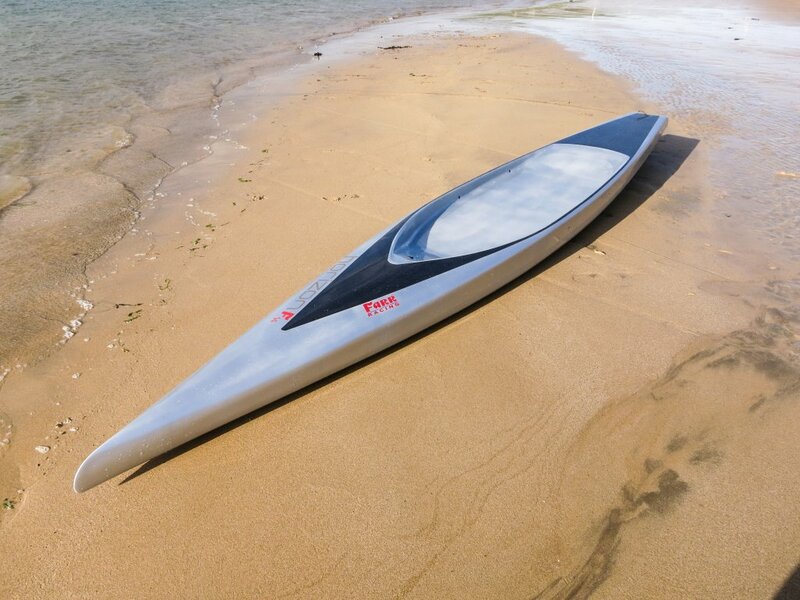 It has enough shape to the rocker curve to maximize dynamic lift when paddling in waves, but without carrying the same wetted surface penalty seen in the competition’s forward sections. The design maintains fullness through to the knuckle so that “effective” waterline length is maintained when paddling in chop, but not so much that the board “trips” over itself. The wave piercing bow is probably the most distinctive feature of the board. A full bow will be “excited” by wave encounters (running into the trough of the wave in front). This will slow the board, requiring more energy to get up and over the next wave. The wave piercing bow penetrates the wave in front without being dramatically excited and avoids a big drag penalty which would result in a loss of speed. It then relies on the buoyancy and shape of the rocker curve in the forward sections to lift the bow up before it begins to dig in. This, combined with a subtle peak along the centerline of the deck, allows the bow to quickly shed water and return to the surface. This bow design works so well, you can only grin at each wave you slice, while the competition slaps along in your wake. Hard, almost chine-like rails, are a common feature on many boards. This is one way to maximize stability for the lowest possible wetted surface but does not account for the drag associated with the vortices shed from the hard corners that are created. The Horizon F14 has much more gradual rails, reflecting FYD’s flow analysis in this area in an effort to find the right balance between wetted surface area, rail radius and total drag. Given the requirement for the 14ft. board to be able to complete mark turns, the rails harden significantly in the aft quarter of the board. On deck, the cockpit rises subtly into the transom, with sufficient width to allow the paddler to move towards the tail, for the turn. The Horizon F 14 is manufactured like a high performance racing yacht — formed in female molds, laminated using carbonfiber and cured. The board is hollow, with internal framing for torsional and longitudinal stiffness. The deck is an EPS sandwich laminate to provide additional rigidity under foot and reserve buoyancy. The Horizon F 14 is stiffer and lighter than SUPs which are manufactured just like their surfboard cousins; by hand-shaping or CNC machining foam blanks from Expanded Polysterene (EPS) foam. As an additional benefit, if the board is damaged it is more easily repaired and will not increase its weight from water absorption. Most fins are more art and marketing than science. The general philosophy is to make a shape that “looks cool,” apply a nifty color scheme, make some outrageous claim about stability or drag, and pay for the endorsement of one of the top contenders in the sport. FYD took a different approach by thinking carefully about all of the functions the fin needs to provide. There is a generous amount of leading edge sweep to promote weed/kelp shedding with extra sweep at the root exclusively for this purpose. A convex trailing edge profile at the tip locally increases the area to increase roll stability. A lot of other fin designs feature a concave trailing edge near tip. Yet, it is counterproductive to add tip area for roll stability and then take it away with a concave trailing edge. The fin has an area of 43in.2 which provides enough directional stability without excessive drag. The fin span is relatively deep to reduce induced drag. FYD developed a custom low drag foil section, tailored to the low Reynolds numbers of an SUP. The design brief for the Horizon F 14 was simple: “Design one of the world’s fastest 14 foot SUPs oriented towards flatwater and estuary racing, with sufficient stability so weekend warriors and elite paddlers, alike, can get the most out of the board.” Farr Yacht Design was given a clean slate to create the fastest flatwater board in existence. Utilizing the experience and design tools of arguably the most successful company of naval architects in the world is a significant advantage when designing a SUP. Other SUP builders simply do not have the design ability. FYD developed a "base" board design which represented the state of the art in the market, and then experimented with over 100 different variations. The boards were analyzed in Fine/Marine, a CFD software, which shows hydrodynamic force predictions. The final, optimized, design shape has an advantage of 15 to 20 percent over the original base design.